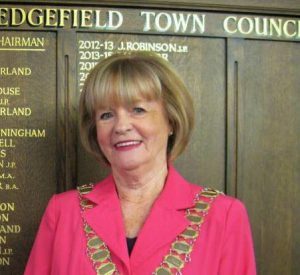 Sedgefield’s annual Civic Service will take place at St. Edmund’s Church on Sunday, 9th September, at 10am. Cllr. Mrs Mavis Wayman (Mayor of Sedgefield), members of the Town Council and dignitaries from other communities in the area will be in attendance. The service will be led by Lay Reader Michael King and will be a service of Holy Communion by Extension. Val Guest, a longstanding friend of the Mayor, will read the lessons and Cllr. Alan Blakemore will lead the intercessory prayers. Michael King said this week: “There has been a long-standing, positive relationship between St. Edmund’s Church and the Town Council and we welcome the opportunities that we have during the year to worship together. “This is one of three occasions on which we hold a civic service. The others are Remembrance Sunday (which this year commemorates 100 years since the end of the first world war) and the annual Carol Service held during the first week of December. “This year, the Carol Service coincides with the St. Edmund’s Christmas Tree festival which will take place in the Church between Saturday 1st December and Thursday 6th December. Altogether, 45 trees will be on display which have been sponsored by local voluntary organisations and businesses”.